Hope everyone has had a great week! We’ve been up to loads of exciting stuff. On Wednesday we had great day filming with Owen from ThumbPrint Design and Chris Bogle. 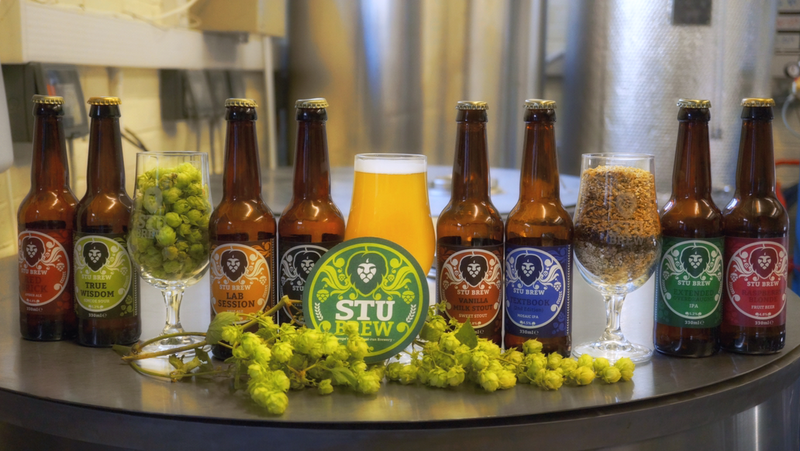 We’ve been nominated for a Green Gown award and we made a video focused on everything Stu Brew does which we hope to show you soon. We’re all very excited about it. This week has been a busy brewing week. On Wednesday Tom and Harry, with some help from Liam, brewed Extended Overdraught. Harry, Carey and Tom brewed Vanilla Milk Stout on Saturday too. We’re due to be putting both of these into cans soon. A few of the team have lent a hand at Northern Alchemy this week which was great fun. The brewing community within Newcastle is so welcoming and it means if breweries ever need help we’re always willing to lend a hand. Fresher’s Week is coming soon which means we will have lots of events to welcome our new and old students. Keep an eye on our social media channels for more information. Trust us, they’re great events we have planned! The first confirmed date is a ‘Pizza and a Pint’ Meet the Brewer session down at Newcastle Tap on Tuesday the 25th of September – with 9AM Lecture, Lab Session and True Wisdom on tap it’s an event not to be missed! That’s all from us this week. Have a good one!